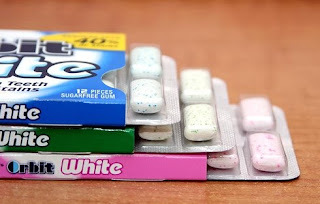 I love gum! It’s like crack. It’s like morning coffee. It’s like a sweet explosion in your dirty mouth. The kicker though is that “party in your mouth” flavor leads to a whole recipe of chemicals. I’m not talking about gum base, or glycerol, or the calorie-free aspartame. I’m referring to the devil – formaldehyde. SORBITOL: A sugar mixed with a little hydrogen atoms creates a compound found in most peaches, plums and fruit. I won't substitute gum for the fruit food group. ASPARTAME: About 200 times stronger than sugar, which breaks down into mini toxins like methanol and then formaldehyde. Should we be worried? I would. ACESULFANE K: The “K” is for potassium, like in bananas, but totally artificial and doesn’t metabolize – meaning you can pee it out. SODIUM BICARBONATE: Yummy, white polish which is the unique selling proposition. It’s short for good ole baking soda. MALITOL: A mild sweetener, great for diabetics (ha! ), yet large doses causes bloating and diarrhea. Don’t take that dare challenge of 15 sticks of gum! Atrazine in our Water Supply, Again!